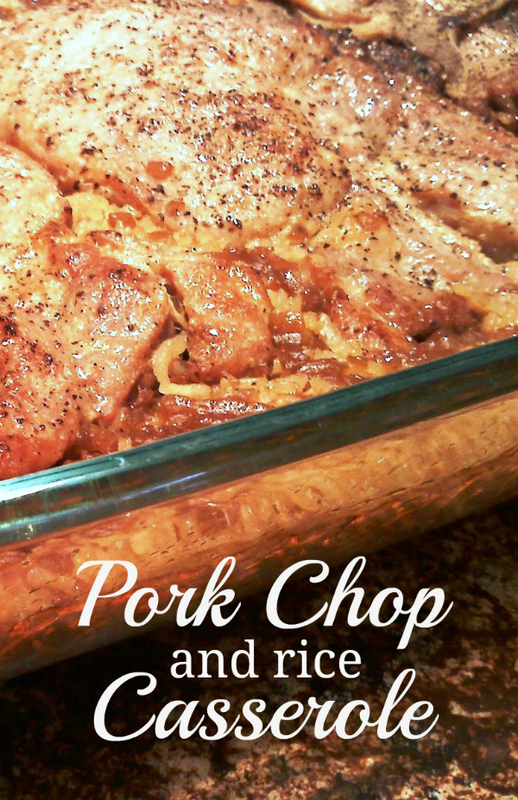 An easy pork chop bake made with rice and French onion soup. This is a dish my mom has been making for over twenty years and I have a feeling it was something she actually discovered on the side of a soup can once and decided to try it. It’s ridiculously easy and yields the moistest, fork-tender pork chops you will ever eat. Also? This is made with rice, which, as I've said before, is in my blood. I should probably call this something like ‘Pork Chop & Rice Bake’ since that might describe it better but Mom’s always called it a casserole so that’s what we’re going to call it. If you don’t agree, I’ll let you take that up with Carol. Mom’s recipe calls for breading the chops in flour which I don’t do. I find that the breading gets soft and soggy while the casserole cooks so I really don’t see the point in it but feel free to dredge your chops in flour before you brown them. Season pork chops liberally with salt and pepper. Heat vegetable oil in a large skillet over medium-high heat. Brown pork chops on each side (do not cook through – just sear the chops on each side). Add soup and rice to a 13x9 baking dish then stir to combine. Arrange browned pork chops on top of rice in a single layer. Cover dish tightly with aluminum foil and bake at 375 degrees for one hour. I'm going to give this recipe a try, but use my homemade stock as I try to avoid canned food whenever possible. I’m going to cry, really! Since four years ago I became friend of Pepa (a dear exchange student in my city from Chile) and tasted her way I desperately tried to find the right recipe to cook it myself. And here you write this and I fell like I’m in Heaven! I like pork chops any way I can get them. Those canned soups sure are a time saver too & they add a TON of flavor. Sharing this one on facebook!! Thank you for linking up to Weekend Potluck! Can't this be made on top of stove, after browning add soup and rice to same pan and cover tight, lower flame and simmer for like 20 minutes? sounds so much easier and don't have to heat the house up with the oven on..???? I suppose it could be made on the stove but the chops won't be as tender as they would be slow baked. If you try it, let me know how it turns out! Well I cook my Rice before hand do pork chops like you, but I use cream of mushroom or cream of celery then serve it over rice !! My mother-in-law made a recipe similar to this which my husband suggested to me and we were married in 1950. My kids made my recipe for their kids and it was always a big hit. I brown the pork chops (or not, whatever you prefer) and in the same frying pan I add a cup of Minute Rice and a can of tomato soup, mix well and I do summerge the chops into the mixture. After making it once, you may want to add a little water or more soup, depending on your taste. It can be dryer without enough liquid. I bake it at 350° for an hour, covered. All in the same pan. Sorry, after all these years I don't seem to have it down to a science to the exact amount of liquid. It depends on your taste. I do think doing the same as your recipe and substituting tomato soup for the onion soup should work as well. Good luck! My sister-in-law gave me a very similar recipe almost 30 yrs ago, and I was reminiscing and fondly remembering it so I tried googling to try to get it, but had to go threw a lot to finally get yours - the only once that came close!! The one I used to make was rice & mushroom soup combined with maybe a can of water?? The chops were nestled into the rice as I recall, covered, then an hour later take out of the oven and perfection! Never had to cook the chops first, just all in same pan. It brought back memories, and I'm going to try it again. I too have a similar recipe with tomato soup and some water but adding 1 bay leaf onion salt and pepper and if you wish onion powder. What can u use instead of the french onion soup, I don't care for it. You can substitute two cans Beef Consomme if you'd like! Mushroom soup is what we use. Plum bodacious..
Mushroom soup....oh ya. Sometimes I throw in some fresh mushrooms with it. If you add 2 cups of uncooked rice will you have to add an additional can of soup or cook any longer? Definitely... for each cup of rice, you will need 2 cans of soup. I don't think you'll need to cook it longer but if so, maybe only 10 minutes. I added 2 cups of rice, 2 cans of beef consomme, and 2 cans of french onion soup. It was easy, delicious, moist, and made enough for us to have leftovers for my family of 3. This recipe is a keeper! Thanks for sharing! Could this be done in the crockpot? I'm not sure. I don't know that the rice would cook properly that low and slow. If you try it, please let me know how it turns out! Rice can be cooked in a crock pot with whatever liquid. I do it all the time as I don't care for babysitting rice on the stove, and I don't have a rice cooker. One of my favorite things to do is to brown some venison cuts or sausage links and toss it in the crock pot with one cup of dry rice and some onions, peppers, and a few cans of beef stock. I cook it on high for 4 hours or low for about 8. Trying to reproduce this in a crock pot... Results are going to vary, but it's definitely doable. Yum! Next time my husband brings home a raccoon, I'm going to do this. I bet you could use the Lipton, dry mix. My Mom made her roast with this for years!! Girl, that's EXACTLY how I make my roast! I'm sure you could use the soup mix here too... I'd use two. What's the point in browning the chops? Can you just slap them on top of the rice and bake? I guess I am lazy like that. Many moons ago I wondered the same thing and made it that way. And it was a hot mess. I guess searing the meat plays a part in how it cooks. Sorry! BROWNING THE MEAT SEARS IN THE JUICES ..
No, don't add any water to this - just the soup. If you decide to try it out, I hope you like it! After an hour, in a tightly sealed casserole dish....rice was still crunchy...even after TWO hours.....should it be instant rice?? No, I've never used instant rice. ??? Did you use two cans of soup? Did you use a 13x9 pan? I have used instant rice..It was amazing.Making this for church pot luck next Sundsy.. I dont have a 13x9 pan with a close fitting lid...i have a oval pyrex bowl and my magnalite roasting pan...which one would be better??? Use whichever pan will hold all the ingredients. I don't have a lid for my 13x9 pan either, I use aluminum foil fitted on snugly. I bought boneless pork chops and then saw this great recipe. Could I still do it? Should it still cook for an hour? Absolutely! Yes, still cook for one hour. Ok Thanx! I'm making this for dinner tonight. I do something like this with mushroom soup, but haven't tried French onion. Sounds great! I'd love to do away with condensed soups too, but sometimes nothing else works as well! We will be havingg this, soon! Thanks! How can I double this?? This would be one of those recipes that doubles by literally doubling all the ingredients. You'll have to use a bigger baking pan than 13x9 or either use two. Hmmmm... I wouldn't think you'd need more liquid but I've never cooked it that way so I'm not 100% sure. I'd say I'm a solid 91% sure. You can also just put 1 can of French Onion Soup and 1 can of Beef Consomme with 1 cup of Uncle Ben's Long Grain Rice into a casserole dish and bake it at 350 for 1 hour and cook your pork chops on the grill for about 25 minutes and you don't have to do the extra browning on top of the stove. Then you have the option of doing chicken, beef or whatever meat you want on the grill. I usually double the recipe for the rice and soup recipe and I don't add any water. No need. So happy to have found your site and this looks like a GREAT recipe! Um this recipe saved me tonight. I didn't even have teh canned soups, but I used beef bouillon and perfection. THANK YOU! Suggestion: Use dry onion soup mix instead of canned onion soup. Prepare pork chop in the same manner in the above recipe. Place rice in bottom of a 9 X 13 inch baking pan or dish then pour 2 cups of water over rice. Sprinkle 1/2 of the envelope of dry onion soup mix over the water covering the rice. Place pork chops on top of the rice mixture and sprinkle remaining 1/2 of the envelope of the dry onion soup mix over the chops. Bake as directed in the above recipe. **Note: Add a little spice in your life and sprinkle pimentos and hot sauce over the rice before you add the chops. I've made a similar casserole before but used just the consomme. I also sauteed onion, green pepper, and a little garlic and mixed it in when I combined the rice and consomme. Very good! My Mom used to make this & now I do. However I don't flour the chops, I just brown them. It's the only way I like left-over pork chops!!!!!!!! This dish was a mainstay when my sons were growing up. I made this with cream of chicken soup and chicken broth instead of onion. It was delish! Need to make this again! There is only me. Can I cut this receipe in half? If so what would be the amounts and the time to cook? Use exactly half of the ingredients and a small casserole dish (don't try to cook in a 13x9 pan) and cook at the same temp and for the same amount of time. That should work! 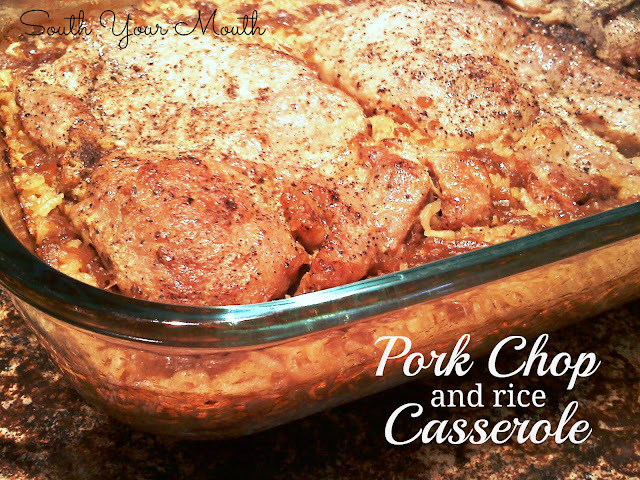 This dish and the ones others suggested are just different versions of the "No Peek" casseroles. 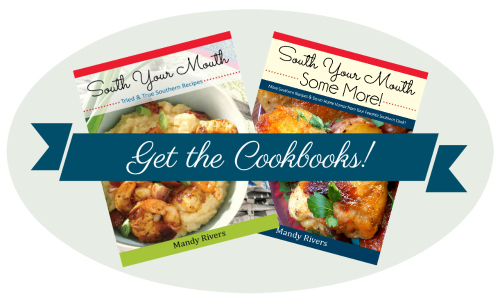 Their are so many yummy versions of that dish that you can't help but find one or many you like. What is great is just about any type of condensed soup works if you make sure to use the proper wet vs dry ratio to ensure the rice cooks properly. One cup of rice requires One cup of liquid, if you like it creamier use up to 1 1/2 or 1 3/4 cup of liquid to One cup of rice. You can also add frozen, canned or sauted veggies to make them healthier and you can add your favorite spices to make your own unique version of the dish. You can use just about any meat, chicken, chops or turkey. The MOST important thing to remember is using enough liquid so the rice cooks to a creamy consistency and to COVER it TIGHTLY for at least 1 to 1 1/2 hours. Oh and searing the meat before hand helps lock in it's natural juices for added flavor. Btw, if I'm using "cream of something" soup in my rice casseroles, I always add at least a 1/2 to 3/4 cup of milk because I like a creamier, saucier casserole. I also will add additional spices because adding the extra liquid will make it blander than the original recipe and also because I like tweaking recipes to make them more flavorful. I don't necessarily stick with just the spices in the recipe either, I use whatever spices I think will make it better. My family has been making Pork Chop Casserole for as long as I can remember. We use Tomatoes (crushed) with Chicken bullion. We also have the Pork chops on top of cup up onion and then the rice is on top of the chops with the warmed tomatoes and bullion poured over and cooked covered in a 350 oven till the rice and chops are done. Thanks for this new way to do the casserole. My Husband is fussy when it comes to pork chops, fixed this one night and his response was, "this is a keeper". The pork chops were so tender and juicy, and the rice was yummy and flavorful, sad to report there were no left overs. I was looking forward to taking that to work the next day. I made this but I used beef broth and the boxed french onion soup mix.. I had this recipe many years ago and then lost it. So glad to see it again! It is a great recipe to serve to guests because it is so quick and delicious. I am so with you about casseroles because of the soup. But I think think sounds goo as French onion is my favorite soup. Although I have never found a canned one I like, but cooked with rice I think would work! TY!! Wow sorry about my spelling LOL!! I've been making this for over 30 years, and the one foolproof way to make this is by using two cups of rice (I use Uncle Ben's, and it never fails), two cans beef consomme, and one can of beef broth. I usually add about half a can of water too. Definitely sear the pork chops. I've skipped that part before, and it's not as good. One thing I do is saute an onion in butter, add the rice and cook it about a minute in the butter, then add the broth and consomme. Bring it to a boil and pour it into the casserole dish. Mushrooms are good in this too. Don't try this in the crock pot or on the stove. A good old oven is what you need to make this work well. can I use smoked bone in pork chops?do you know a good pork chop receipe using slice potatoes and cheese? Hmmm... well, I'm not sure as they're probably already cooked through. If you decide to give it a shot, let us know how it turns out! Can't help on the the other recipe, though... sorry! Mix a can of cheddar cheese soup and a can of french onion soup. Slice a couple of potatoes layer them in the bottom of a 9X13 pan you can make a double layer of potatoes. Put six chops on top of potatoes and pour soup mix over it. Bake at 350 for an hour. Can I substitute turkey breast chops for the pork chops? Hmmm.... I can't say that I've ever seen those but I imagine it would work. If you try it, let us know how it turns out! They were awesome, even my husband went back for seconds. I have started using these instead of pork chops in most recipes because I believe it is healthier for you. Of course, I will still fix pork chops for my husband. One more thing I substituted was the gravy--I used canned Turkey gravy and just loved it. Do you add a can of water with the soup? Nope, no water. Just the soup. Can I use Jasmine rice as a substitute? We love jasmine more than long grain rice! I think so but you might have to use a little more rice since jasmine doesn't require as much liquid to cook. I grew up on a recipe similar to this, but instead of canned soup she used the Lipton Dry Onion Soup packs and water. Then on top of each chop she would put a ring of green pepper with a dollop of chile sauce inside the ring.....good stuff! This recipe was great! I was wondering if anyone had tried it with brown rice, if so how did it turn out? I tried it with brown rice and commented below. Well, I may as well contribute to this thread-- got some great ideas for the future so thanks everybody! I grew up on a version of this dish as well, from the time I was about 10 years old, so I guess it's been in the family for about 40+ years. Our version is cooked on the stovetop in a large skillet. Brown the chops, set aside for a bit. Add a bit of butter to the hot pan, then dump in your rice (Uncle Ben's long grain) to brown in the butter (stir constantly or it'll burn). Add two can's Beef Consumme, a couple of chopped *green* onions (maybe another one as well if they are on the small side)-- include the green part of the onion. Add the chops back into the pan, cover and simmer on a low flame for about 20 minutes or until the rice absorbs all of the soup. I'm not a great cook, and can never ever help myself-- I check on things over and over and the rice always turns out great. I tried it with BROWN RICE last night. I used 4 boneless pork chops, 1 cup brown rice, 1 can beef consommé, 1 can French onion. I rinsed and boiled the rice for about 10 minutes before I put it in the casserole dish. Then I baked the rice with the soups for 20 minutes (covered with foil) while I browned the chops and cleaned up. Then I pulled the foil back, added the browned chops to the top of the rice/soup mixture, replaced the foil and cooked for 40 minutes. There was more liquid left in it than usual so I cooked an additional 6 minutes without the foil. My husband loved it and I liked it almost as much as I do with white rice. I was worried since no one had posted with comments on brown rice yet but I will be making this again! I made a similar recipe in the early 80's from my Better Homes and Gardens New Cookbook "pork chops on rice" the method is all the same (brown the chops first)but the Minute rice is 1 1/2 cups and the liquid is 1 cup orange juice and 1 can condensed chicken and rice soup. (no water) bake in 13x9 at 350 for45 min then uncover and bake 10 min more. Delicious! My mom always made this too and called it pork chop casserole. She never floured her pork chops either. I make this for my family now. Also do it with Chicken breasts. Rice recipes are wonderful but, not so great for diabetics, it drive up the blood sugar. Sure! I think it's better with bone-in chops but the boneless will certainly work! Some of you might enjoy...for a bit of flavour try 1 to 2 tbsps soya sauce and maybe a bit of garlic...fresh, powdered or garlic salt. I want to make this this weekend, but have one question... do I use thin OR thick-cut pork chops? I'm thinking thick cut. I looked through all of the comments but didn't see anything regarding which to use. What I'm really trying to find out is if the cooking (baking) time is the same no matter the thickness of the chops? LOVE LOVE LOVE, i made this last night and my picky family loved it. My oldest son does not like rice but he had 2 portions of just the rice. My mother in law that is always critical of the new recipes that i throw on her loved it. she packed her lunch before dinner was finished!! Thanks so much for a new family meal. Thick pork chops take too long to get really tender in this recipe. Also tried Golden Mushroom soup for a totally different taste with the pork chop juices!!! Very tender with good gravy for the rice. I tried this recipe, making it exactly as you had outlined. The rice was delicious but the pork chops were tough. Any suggestions to tenderize them? I've always found that bone-in chops do much better. And not the pricey, lean ones... the ones with a good bit of marbling and fat. I think I'll add a note about that! Any new comments re: making this in the crock pot? Any adjustments needed? Do you still brown the chops if made in the crock pot? Any adjustments to liquid (soups or liquid)? thanks! Mandy, about how thick should the pork chops be? I'm sure if they're too thin they will overcook, but if they are TOO thick, they will undercook... What do you usually get? I usually buy chops that are about 3/4-inch. I can't imagine any not cooking through though after they've been browned in the skillet and then cooked in the oven too. Very tasty!!! I will make again for sure! In the oven now. I used 1 can each of French Onion and Cream of Mushroom soup. Seared the chops in my cast iron in the oven (set at 450), mixed the soups in a bowl, put the rice on the bottom of the casserole dish, placed chops on top of rice then poured the soup mix on top. If it passes the hubs test it will be a keeper!!! should i use homemade beef consomme instead of the french onion soup for this recipe? If no, can you suggest me some good types of store bought beef consomme?